Many many moons ago, before I set off on my first travelling adventure I never saw where I live through the eyes of a traveller. Everything was better than being in the UK. The grass was indeed greener in my eyes. Now I travel the UK, as a traveller. And while my neighbours are oblivious when I mention hidden gems to them in their home city I am glad to see the world differently now. Many people go into Gloucester city, go to the same commercial coffee shops, known throughout the world, go to the same department stores in every single city in the UK and then they return home. Everything is safe, not many people go exploring any-more. So here is a little tour of the City of Gloucester through my eyes. 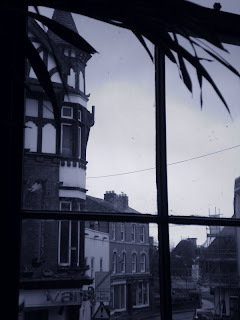 It may be a little different to your usual city tour but I tend to look at lots of nooks and crannies when travelling. 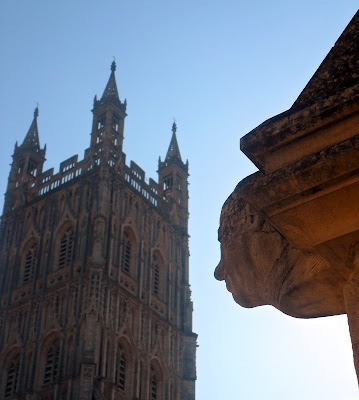 Gloucester has a whole lot of history to explore, a very ancient setting with a fabulously beautiful Cathedral. 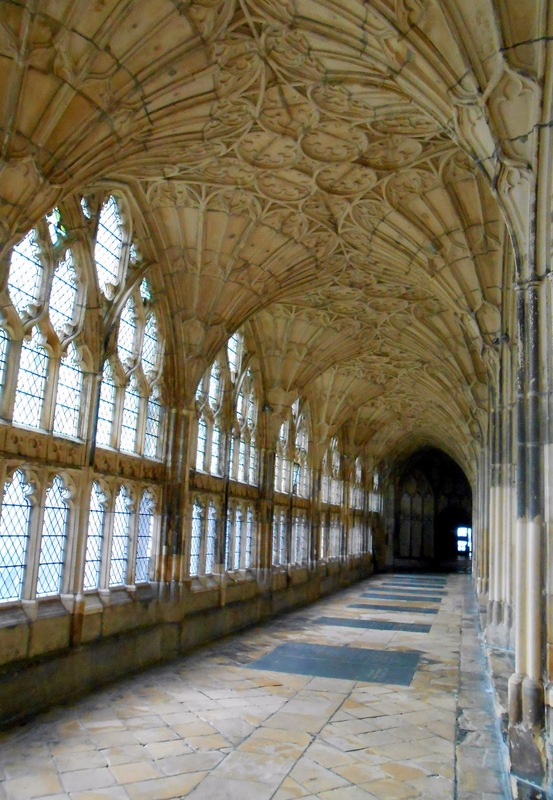 Gloucester Cathedral is one of my favourite Cathedrals in the UK and the setting of many TV programmes and more importantly (for me as I am an absolutely obsessive fan), the set for the famous Harry Potter movies. such a dreamer I can often be. 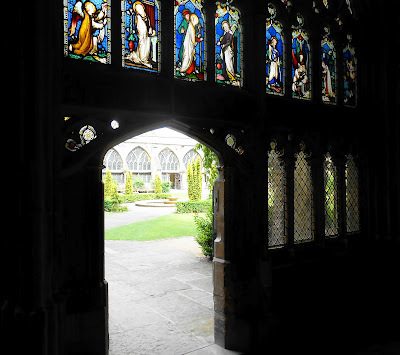 (The Cloisters - Gloucester Cathedral). Being an obessive fan I probably see the Cathedral more through the eyes of a Potter fan than a history buff but anyone that is into history and architecture will not be lost here. The Cloisters is one of my many favourite parts of the Cathedral but I also love the mammoth size and beauty of this Cathedral and I promise you it will have you you gasping in awe. It is 'that' beautiful! 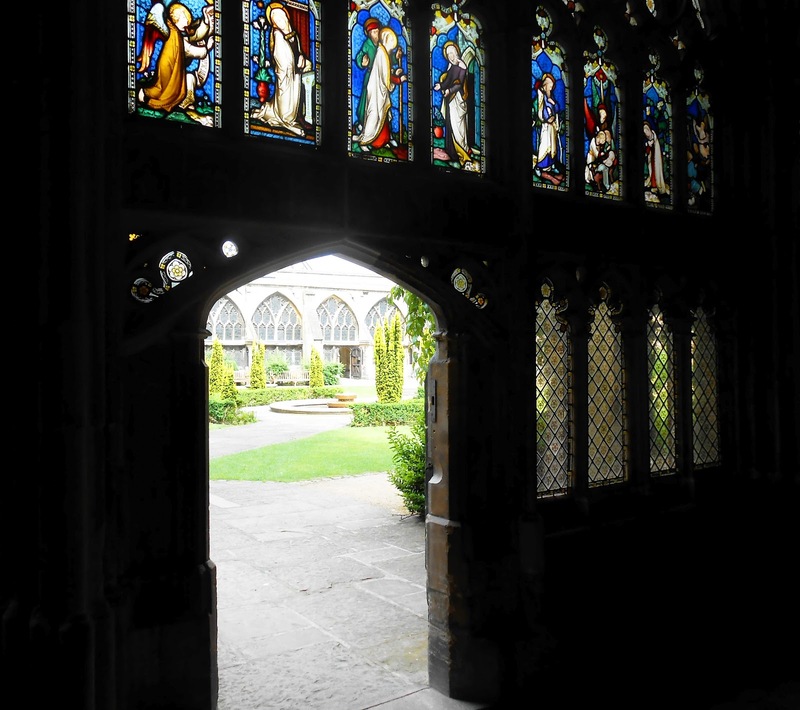 One thing I love about Gloucester Cathedral is it is a very welcoming place. 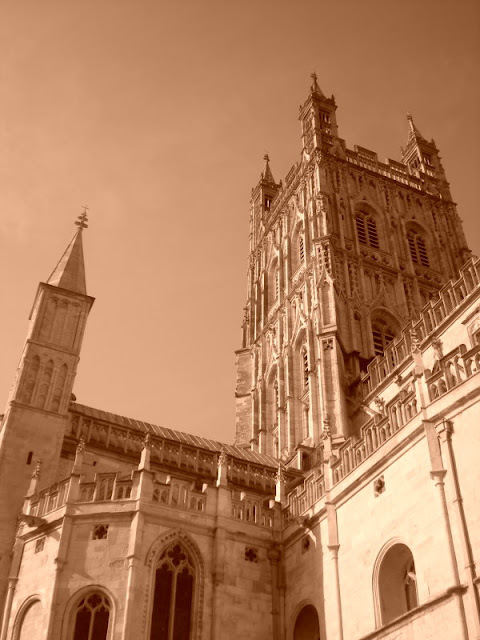 I have visited other Cathedrals in the UK and I have felt very pressured into paying an entrance charge (Although if you are a tourist and travelling to the City of Gloucester I am sure you will want to donate to this fabulous place). As a local I cannot abide the constant stares when you walk through the doors with almost bouncers standing there expecting payment. This is one of the reasons I have never visited Bath Abbey, as being a traveller on a budget sometimes, I feel places of worship and peace should never pressurise a visitor to pay. Gloucester Cathedral is just that for me. I come here to simply be and enjoy the peace. One of the rooms with more modern stained glass windows in the Cathedral is the Blue Room. I find that room fills me with peace, if I have a heavy heart I can find my peace in that room. I also find the courtyard in the centre of the Cloisters particularly lovely on a sunny day. The Cloisters was one the main settings for the corridors of the famous Hogwort's School of Witchcraft and Wizardy in the Harry Potter movies. And to my new knowledge "...the Cloisters are one of the earliest surviving fan vaults designed between 1351 and 1377 by Thomas de Cambridge..." (Wikipedia). The Cloisters Fan Vault ceiling and the setting for Harry Potter. Upon visiting, this area really draws you. 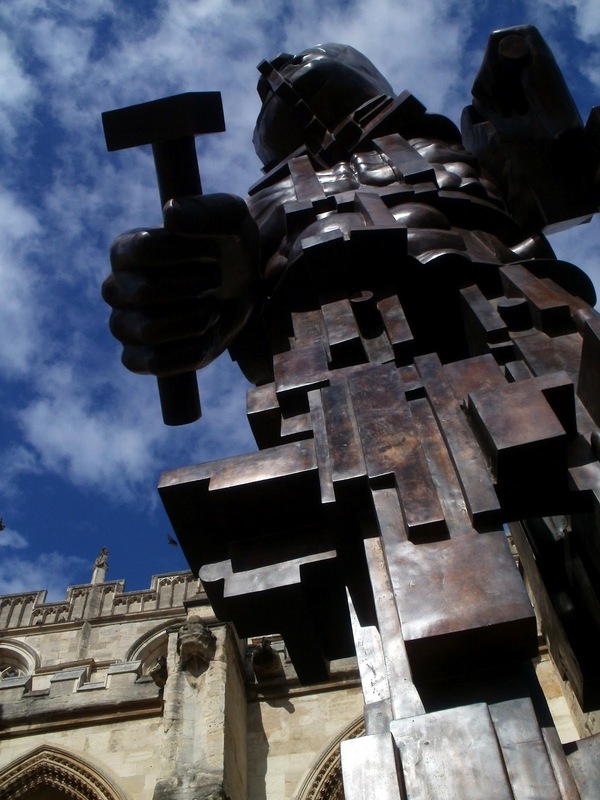 As you can see this is quite a piece of fantastic creativity on behalf of the designers and builders of the cathedral. It often astounds me that the cathedrals in the UK were ever built, because the amount of work put in to making these places of worship was phenomenal. Other than the artistic beauty of the Cathedral, this Cathedral seems to be very open to sharing its space with film crews, meditation groups and many art exhibitions throughout the year. It has a feeling of openness, instead of stuffiness, which I really like. A place for the people. Over the years many art exhibitions have entranced me and I have revisited the cathedral many times. They also hold music events throughout the year. 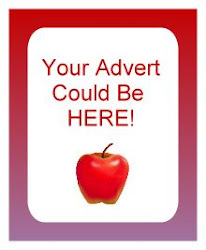 Be sure to check out the website if you are visiting the area here. One of the amazing sculptures placed directly outside of the entrance in more recent years was this one to the left. It was outstanding and very progressive of the Cathedral to allow such a large piece to adorn its entrance for so long. This Cathedral knows how to entertain and draw in all age groups. A centre of inspiration and innovation. I hope it stays this way and continues to enable the spiritual and artistic worlds to regularly mingle and to be an open centre for both the local community and visitors to the area. simply because I love this place so much. If Gloucester Cathedral does leave you gazing, there are plenty more architecturally stunning places within the UK to also visit on your travels. 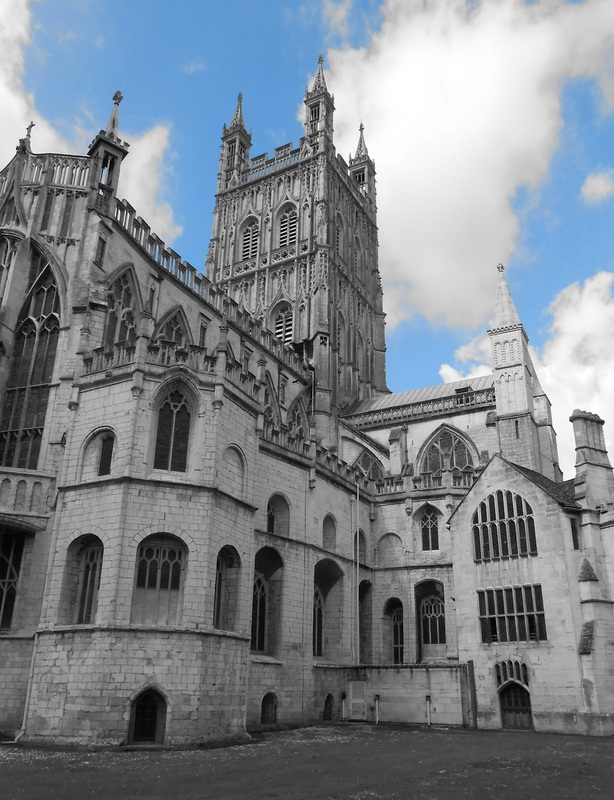 Now Gloucester, as cities go, is often frowned upon by neighbouring towns. I used to work in Stroud and Cheltenham and some of the residents of these places look down on Gloucester as scruffy and full of uncouth people. I say they are very wrong and are not looking past the surface. Many of them would come to Gloucester to visit a shop and leave, never looking beyond their own preconceptions. As I am originally from Newcastle-Upon-Tyne in the North East of the UK, I find myself at home in more down-to-earth environments. Gloucester has a wide range of people and is very multi-cultural. Some people don't like this about Gloucester but I love it. I love walking through Gloucester Park and hearing every second or third person speaking in a foreign accent. Other than the guidebook places to visit, like Gloucester Cathedral, I also recommend taking a walk down Westgate Street, past the Gloucestershire County Council headquarters on your left and keep going until you get to Gloucester Folk Museum. 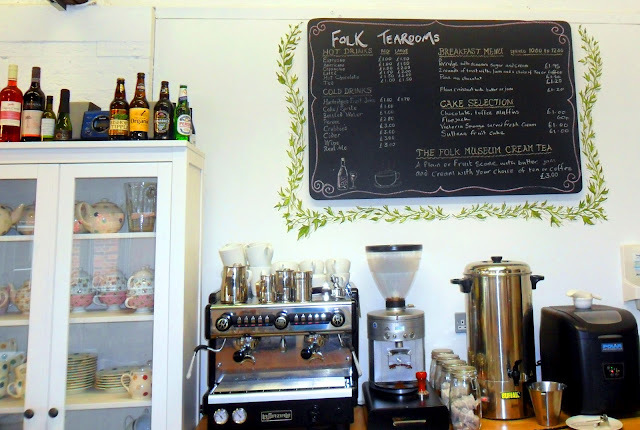 This is a great place for families to visit but also one of my favourite cafes in the area (I have 3 favourite cafes - none of which are your global franchise type cafes - all local and run by locals.). Gloucester Folk Museum tea-room is funded by the National Lottery and as a result the costs are not as high as for some other cafes in the region. 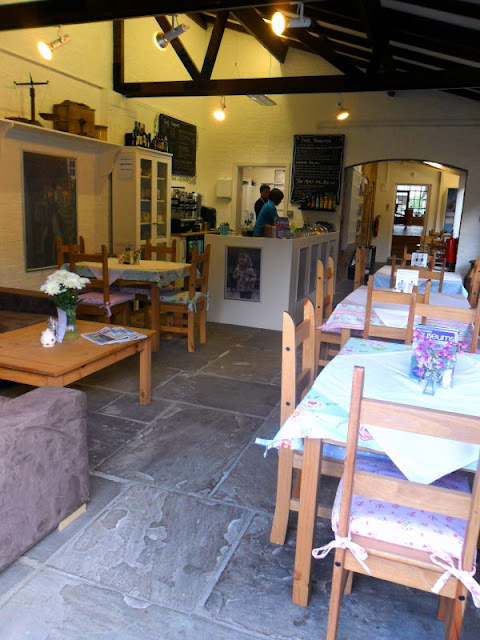 It has the most delightful selection of teas, cakes and lunch options and is very shabby chic in its design. The Folk tea-rooms are quintessentially English, so if you are an overseas visitor I highly recommend a visit. It will take you back in time and give you a taste of the quaint English tea room. 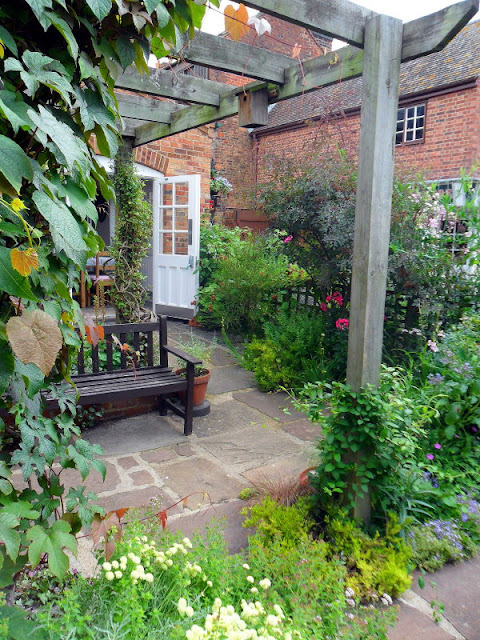 Tea Rooms and Gift Boutique are set within Tudor timber-framed buildings. Beautiful vintage style table cloths and a lovely friendly staff. 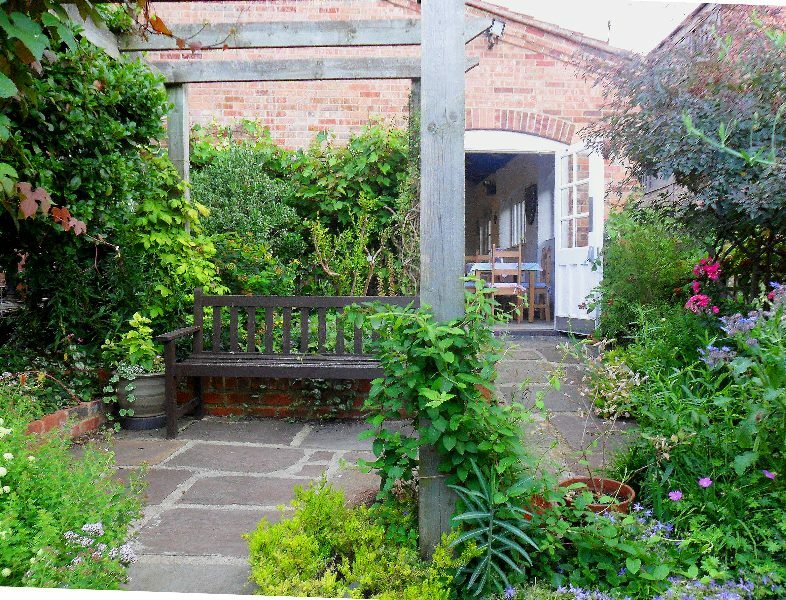 Through the tea rooms is the herb garden. This is wonderful in the summer as you can enjoy your lunch and drinks in the garden, enjoying the perfumed flowers, watching the birds on the feeders, listening to the running fountain and smelling the aroma of nature all around. 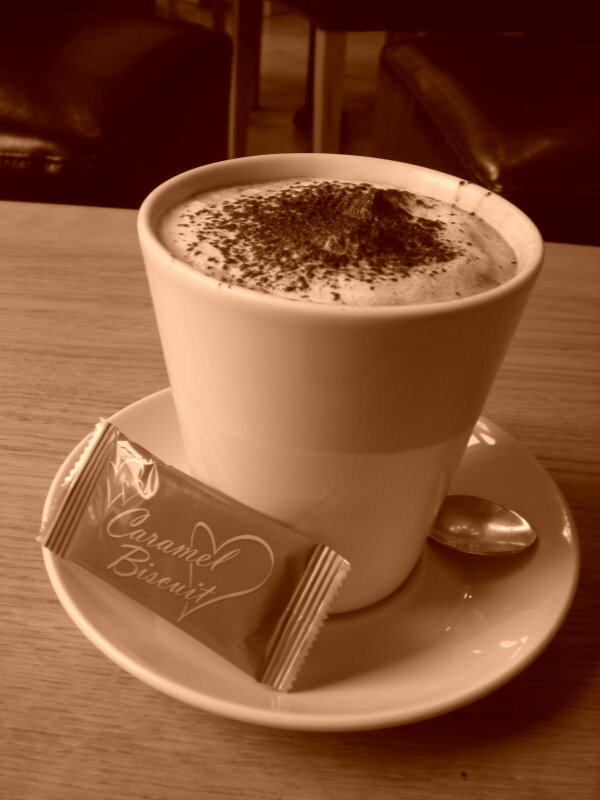 As someone that needs my coffee when travelling, my first quest when arriving in a new place is a coffee shop, so as I have travelled around my local area I have sought out the best of the cafes in Gloucester. Sitting in this garden in late spring, early summer, cappuccino in hand, the sounds of the birds, the bells ringing from the Cathedral nearby does not feel that I am in the middle of the city; no noise from traffic or shoppers nearby. 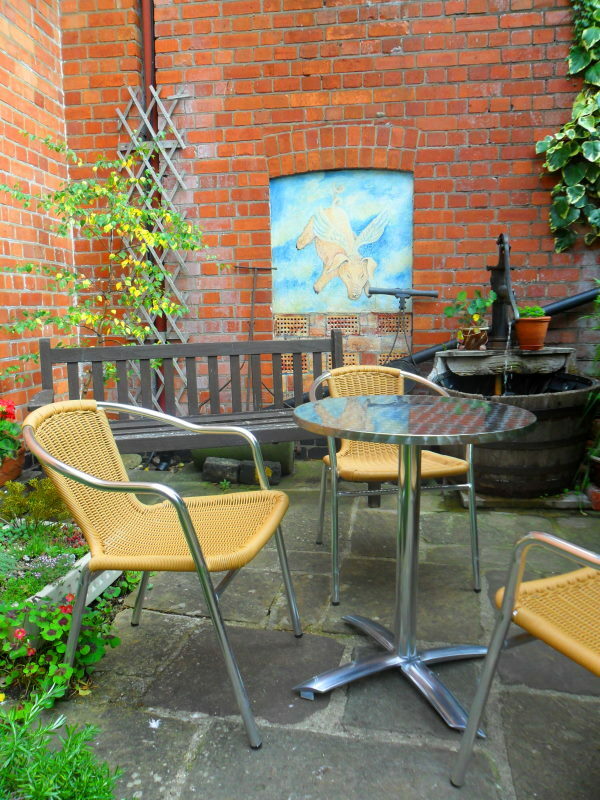 A perfect peaceful haven and wonderful place to meet with friends. They also serve alcoholic beverages for a relaxing afternoon socialising. There is a heavenly little fountain in the garden. I try my best to get this seat as it is in the sunshine and also by the wonderful fountain. I love the fun and playful artwork painted into the bricked-up old doorways. Another view from another visit. 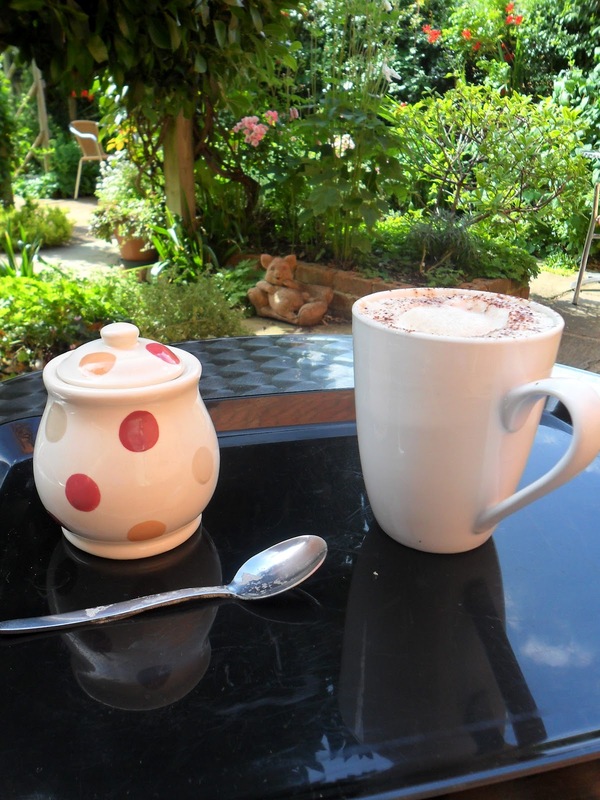 I love visiting this tearoom in the summer. 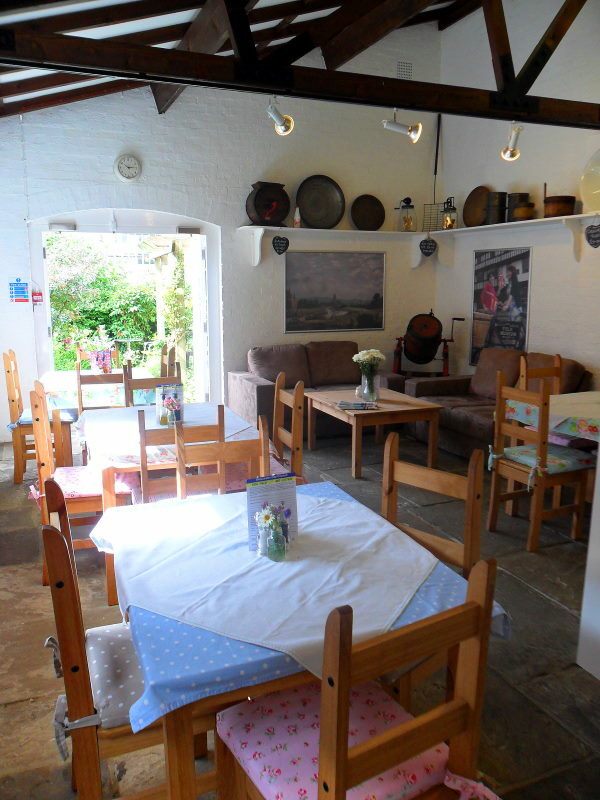 A view back into the tea rooms from the herb garden. Surrounded by nature and scents galore. 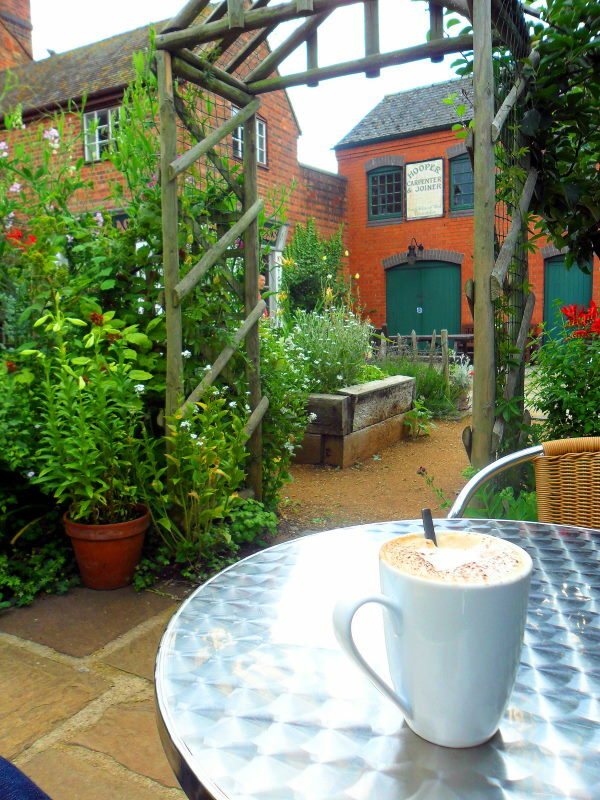 Another central Gloucester cafe is a place I go to when I want to do some writing or quiet reading. 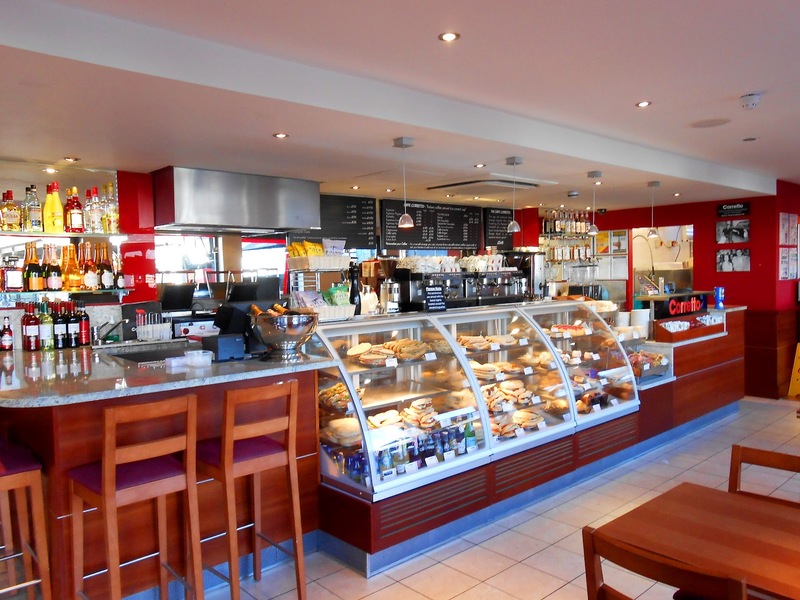 It used to be part of a 'greasy spoon' cafe but once smoking was banned within public buildings, the cafe has a more respectable flavour to it, with a wide choice of food options for the traveller on a budget. However, what I love about it, is the rather well-hidden upstairs to Reids Coffee House (60-62 Northgate Street). I am probably blowing my little tranquil haven here for those that don't know about it, but hey, if I can't give people choices what am I here for ? So going down Northgate Street, past Debenhams (on your right), keep going until you reach a corner cafe on your right called Reids Coffee House (60-62 Northgate Street). You will see a glass front, people sitting at the window on stools, enter and order a delicious beverage. Do not sit downstairs. Go upstairs where you will find lovely leather sofas, comfortable seating and a window view. I like coming here when I am a bit stressed or tired and just want some time out to myself. You get a free biscuit with your coffee and they offer the best loyalty card system (as far as I am aware, in Gloucester). The view may not be awe-inspiring but it is a really nice change from your Costas and Starbucks of the world, if you are looking for a little slice of peace in between your busy shopping spree. They also sell sandwiches, a selection of beverages, cakes and other foods in the coffee shop section of the building. So aside from Gloucester Cathedral and the Folk museum, what else can you do in Gloucester city centre? Well, apart from shopping, there is the Guildhall that often has art exhibitions and music events and the City Museum. Visit some of the city's ancient history trails and pubs and take a short walk to the newly opened public Llanthony Priory. 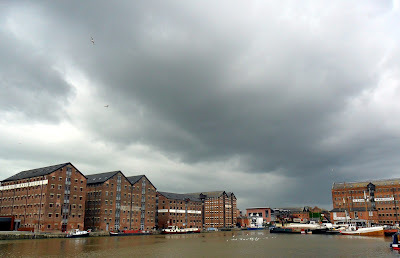 I live within 10 minutes walking distance of Gloucester Docks, and 15 minutes of the city-centre, so I am very blessed with places to walk to and I don't need a car as a result. From Gloucester Folk Museum walk back up Westgate Street past the County Council building on your right and turn right. 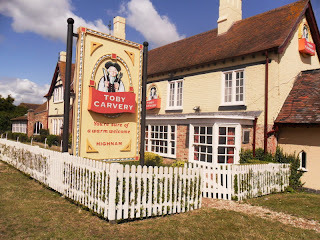 You will pass the Fountain Inn pub on your left. Keep walking until you reach a zebra crossing and on the opposite side of that is the Police station. Cross the zebra crossing, go past the old Fire Station on your left and continue down the road (on your left will be a large empty car-park). This is my short and peaceful route to Gloucester Docks. Once you have crossed at the double traffic lights you will come to the dockland area of Gloucester. I personally love the Docks, a place to go and relax and simply gaze at the water. Gloucester often has the Tall Ships come to the area each year and they stay moored down at the docks. 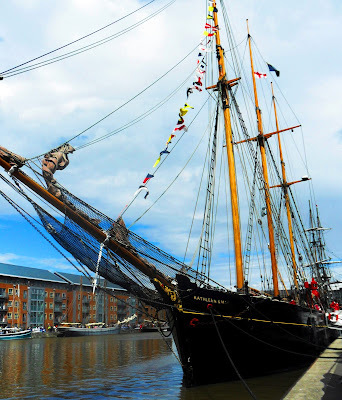 A lovely day out, beautiful tall ships which you can board and take a look around and also lots of stalls and entertainment for the family. One thing Gloucester does do (and more recently has been increasing it) are outdoor events and music festivals. In July we often have festivals in the park, parades and we have a fantastic blues festival held in some of Gloucester's pubs (personally I would love it if they took this festival to Gloucester Park - the atmosphere would be fantastic). They also hold down the docks an annual food and drink festival along with other events throughout the year. After a lovely stroll around the docks, head towards the new Gloucester Quays outlet centre, slowly growing with bargain shopping and before you get to the centre you will see a couple of cafes to visit for lunch or just to have a lovely chat with friends. Caffe Corretto is probably my most regularly visited cafe. 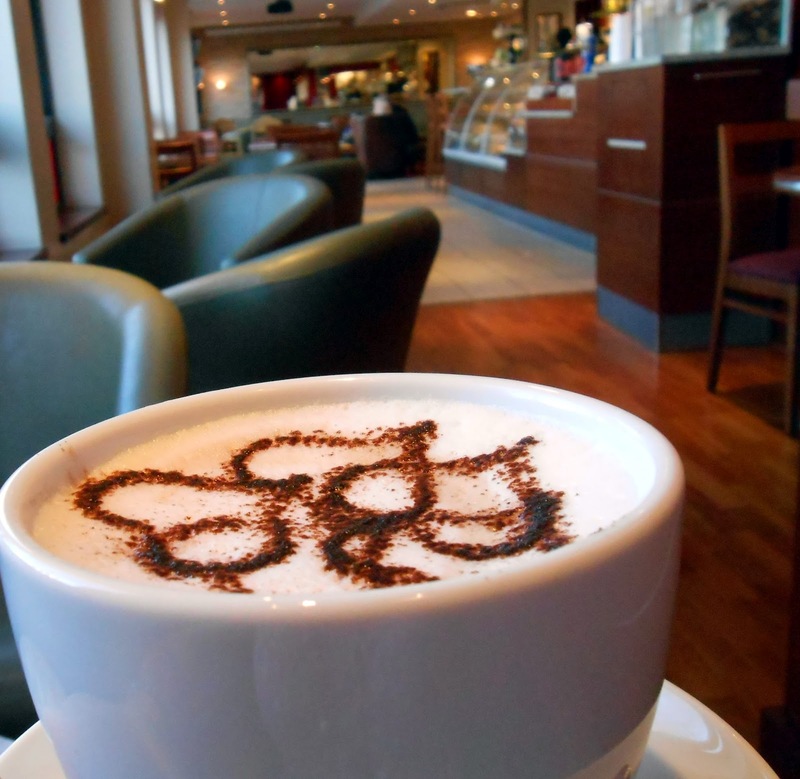 I love the atmosphere, the coffee and the Italian music. 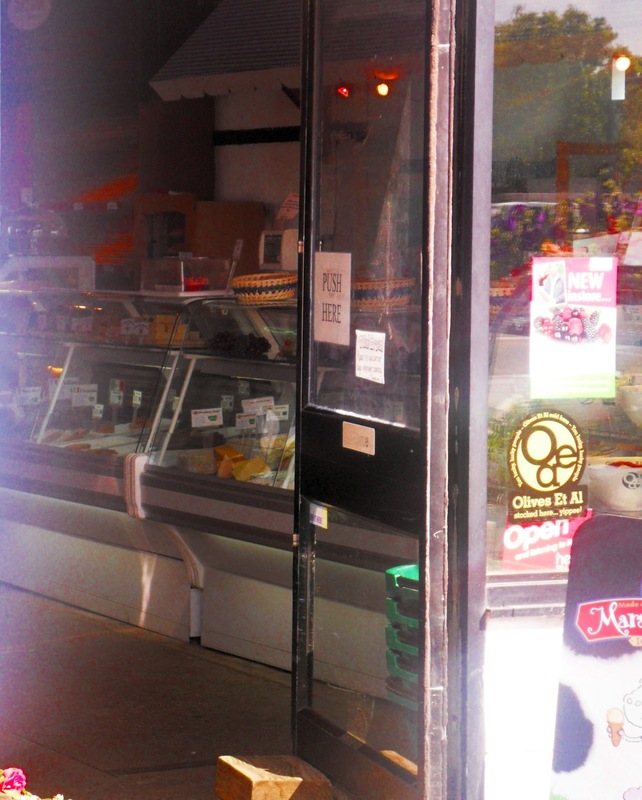 It is managed and owned by a Gloucester family originally from Italy. Quite surprised to not see it mentioned in the Gloucester visitor guide as it's a wonderful place. I have a little ritual when I go to Caffe Corretto. I love to go early in the morning, take a travel magazine and day dream my morning away. I also find this cafe a wonderful place to do my writing and to meet friends. 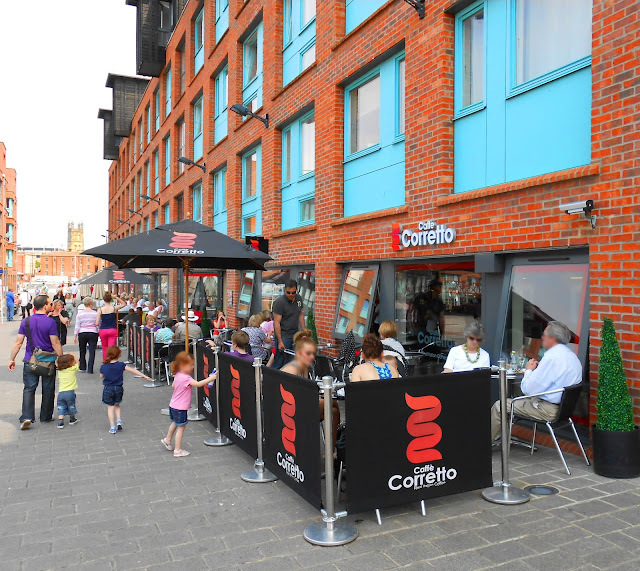 And in the summer months it's a fantastic place to people-watch when sitting outside. As you can see from the photo it is about a 10 minute walk from the Cathedral but well worth the trip. Caffe Corretto is normally quite busy - I tend to arrive at 9am, hence why it looks less busy. 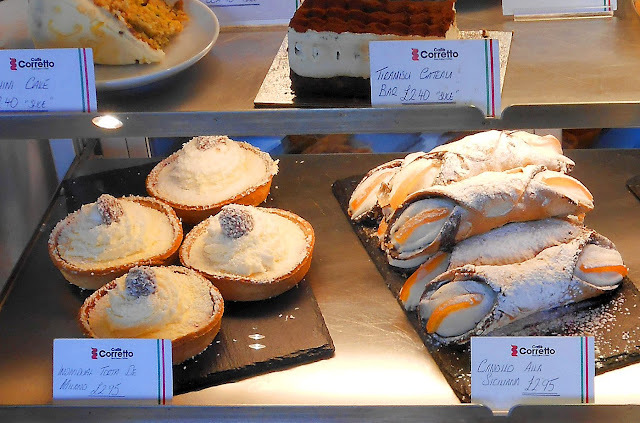 They sell coffee, alcoholic beverages, sandwiches, pastries and a wide assortment of cakes. I realise on writing this blog entry I think I travel through coffee shops (wide grin!). My first port of call is a coffee shop and if a new town or city has a nice cafe they have sold me on the place. Possibly the weirdest way to view a place but what can I say, coffee and people watching is important to me and one of the nicest things about travelling and taking in a new place. 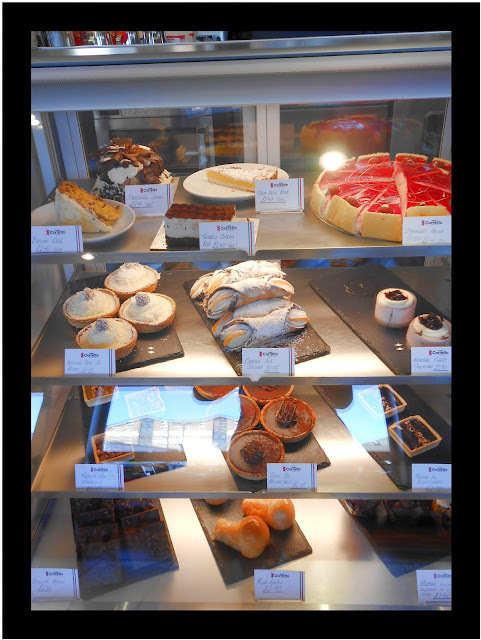 Often the most drool-worthy cakes for sale and very tasty might I add. Visit to try the cakes - you will not be disappointed. I had to give you a close up of a couple of the cakes. Yummy is not even a word for them.. little drops of heaven more like! My cappuccino view, my early coffee start - my weekly date with me at Caffe Corretto. From Gloucester centre, if you are staying more than a couple of days, you can also have some lovely walks from the docks area. Over the other side of the docks where the old Antiques Centre used to be, where the boat yard is, continue past the hairdresser's and Toast shop and keep walking until you can turn left past the car-park for the apartment block (you will have a larger building on your right side). Cross the road to the antiques shop turn right until you reach a small bridge. This bridge takes you across the River Severn. Once across you will come to an easy-to-read map and you can turn left and go along the river down to Lower Parting or further along the cycle path. 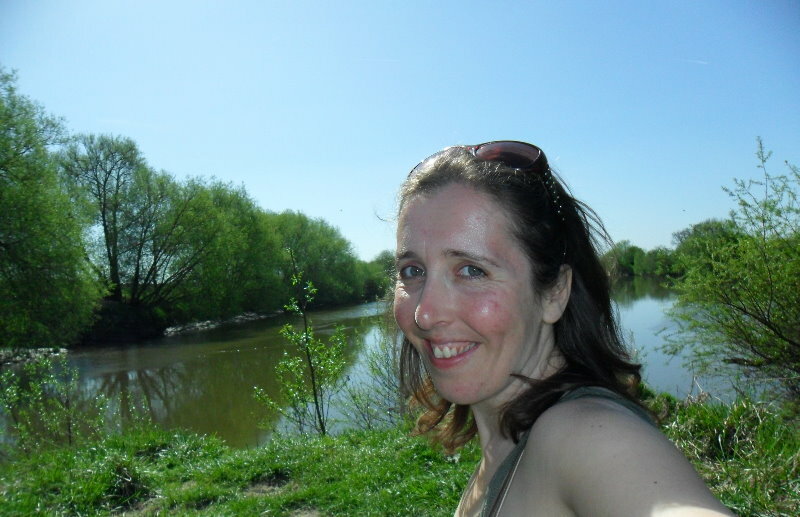 I have spent many times walking to Lower Parting (where the river splits into two, and we get the Severn Bore at certain times of the year), and I enjoy a lovely relaxing peace down by the river. 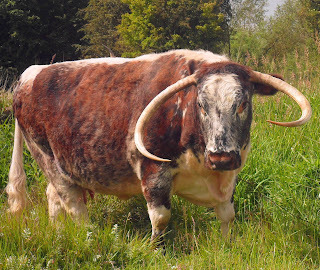 You will also see on Alney Island Nature Reserve (the walk down to the river) some local cattle with big horns. I have lost count of how many times I have walked down to Lower Parting simply to sit, write or just get some perspective on life. So if city life has become too much for you, from Gloucester Docks it probably takes around 15 minutes to walk down to where the waters part. Gloucester has so many pretty walks not far from the centre. If you are healthy and able you can walk quite far out. Other places to visit are Maisemore (you can drive there if you prefer as it is quite a long walk) which has a beautiful large lake and a stunning church. And if you were searching somewhere different for dinner, a very short drive out of town will take you to The Wharf House. Do not let its position deceive you. 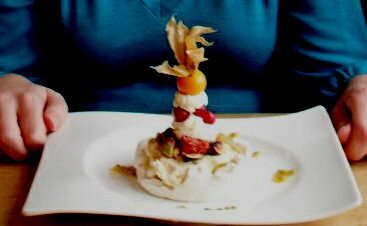 It may be just off the A40 but the food is delicious, organic and local. They have a lovely terrace overlooking the river, perfect for a sunny day and while it is quite expensive the food is of a high quality. At the moment, for lunch they are serving for starters (from one of many options), tiger prawns dressed with a pineapple with coriander and chilli dressing and carpaccio of beef accompanied by horseradish, celery and The Wharf House salad. And one of the many mains they are serving is Cotswold Pork filled with Apple and Fig with buttery sweet potato mash. Now, I have had this and it is gorgeous! And these are just on the lunch menu. Check out the full website here for more options. 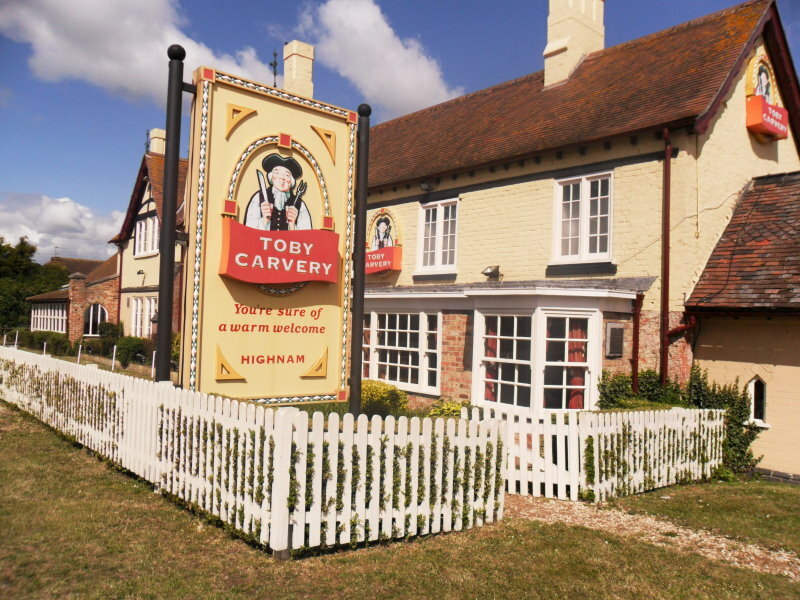 Along from the Wharf House just along the main road is the Toby Carvery, perfect for a sumptuous roast dinner and just past the Toby is Over Farm Market (farm-shop). I love Over Farm, I often walk there from Alney Nature Reserve and up to Lassington Wood (past Over Farm through the lane and up and over). 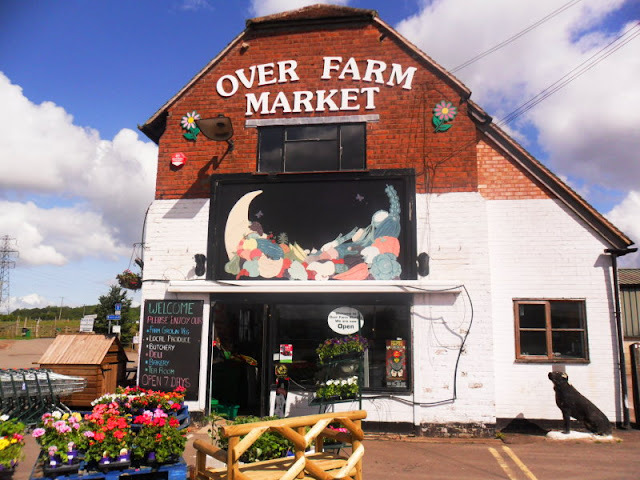 Over Farm has a great range of fruit and vegetables, many picked from their own fields, a delightful range of delicatessen dishes, savory and sweet. and sell coffee, local cider and wine. the hugest amount of buttercream but as you can imagine this went down a treat. My inner child was jumping up and down at the sweeties on top. Over Farm also holds a wide range of seasonal events throughout the year for children and families. Activities range from a fairground, trailer rides, music festival, strawberry picking and a fantastic Halloween festival. Well worth the short trip out simply to indulge in some local produce or to take the family out for a farm experience. So this is my whistle-stop tour of Gloucester. I hope you enjoy it. I could go on forever but this post would never end. If you are interested in things in the area to do, please do pop into Gloucester's Tourist Information on Southgate Street, where you can get maps and locations of other areas to visit. I have listed below my top outings from the Gloucester area if you are here for 4 days or more. Mallards Pike (beautiful walks also home to Go Ape a real treat for all the family). Symonds Yat East (stunning walks, food, outstandingly beautiful area - Also where Harry and Hermoine sat in the woods in the Deathly Hallows part 1 after they lost Ron). Batsford Arboretum (peaceful walks, zen-like gardens, birds of prey centre) & Westonbirt Arboretum (music events, stunning woodland and much more - a fabulous day out for all the family). Bourton-on-the-Water (An authentic Cotswold village, with stream running through; lots of places for tea and scones; and a lovely little bird park and maze for the family to enjoy). 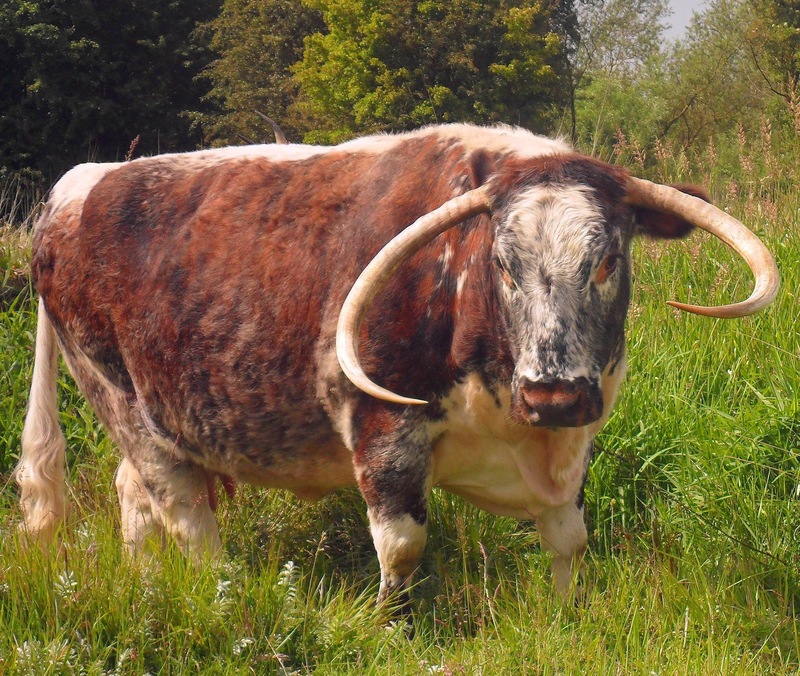 Cotswold Wildlife Park (Large wildlife park - lots of space for animals to roam - a great full day out). 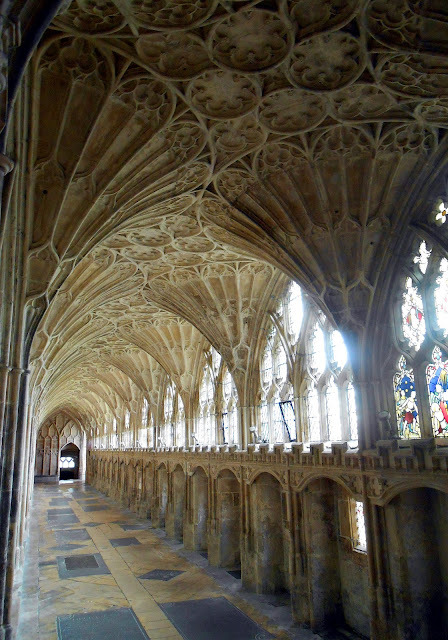 I love all the photos of the Cathedral and didn't know that Harry Potter was filmed there. The pastries and coffee look scrummy, I could just imagine myself sat down there scoffing down a lovely bun and having a nice chinwag. 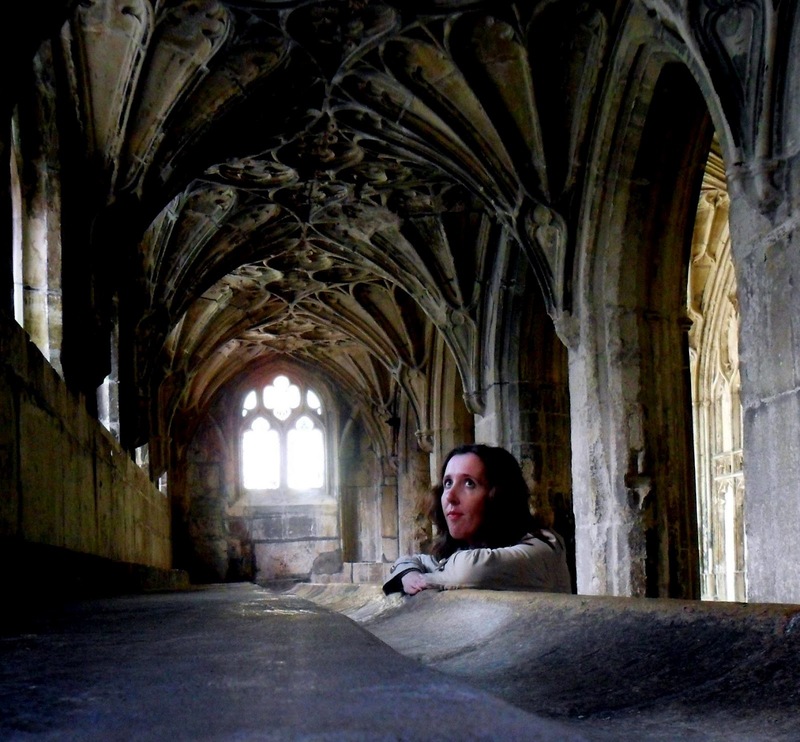 Oh yes Harry Potter was filmed at Gloucester and also Durham Cathedral and a few places I am yet to see (grin). 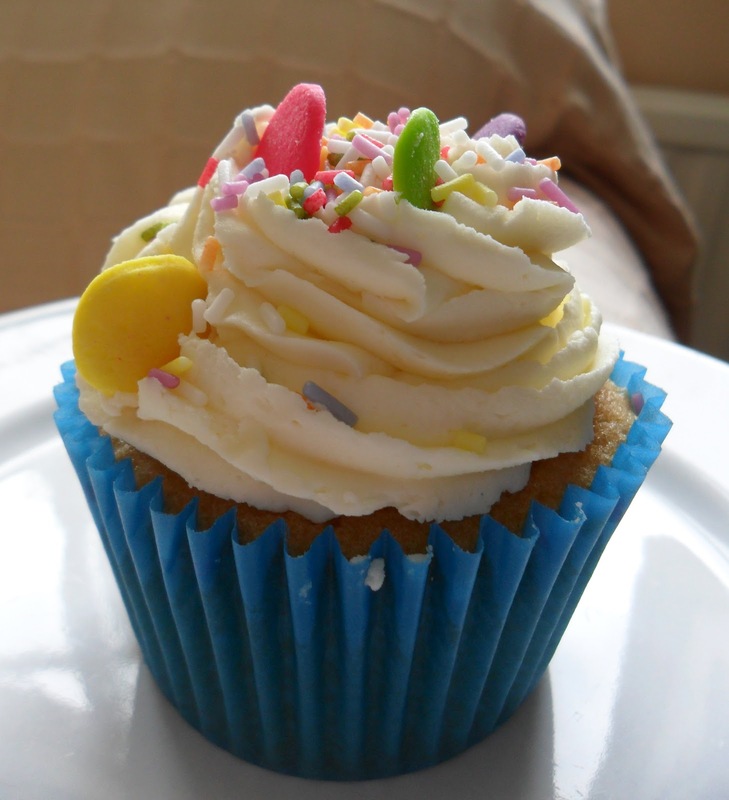 Can't wait to go to London :-) Gloucester has some lovely cakes and cafes, I have a cafe obsession I think LOL! thanks for your comment hun. Oh gosh the photos are gorgeous! I went to england when I was 18 and was able to explore the country side. Loved every minute of my time there ~ I remember going to Canterbury and exploring the older buildings, churches, castles and having lunch/dinners at the many pubs around where I was staying. Love the idea of visiting Gloucester! Oh love Lisa, Canterbury is beautiful! One thing we do have in the UK is a lot of history and beautiful architecture. I love all the Churches and Cathedrals. One thing my Mum always did when I was a child was take me into churches as she thinks they are beautiful too.